Last week I was in New York for a brand positioning assignment. The customer assured me casually that the hotel would be a unique experience. I was a bit skeptical, because in the past I have slept often in hotels all over the world and you basically see a lot of the same. Of course there were some exceptions such as hip design hotels, but I was always bored after a few days. There was always something that simply did not fit the image. Initially funny things suddenly became very obvious or even annoying. Or interaction with the staff was different from expected. Upon entering I was greeted by a man in a big blue blouse with sleeves rolled up. He had a beard, unkempt hair and some tattoos. Indeed, this was the hotel manager. Super relaxed and sincere friendly. The receptionist had purple hair, sparkling eyes, a big smile and I got a greeting from the heart. The crowded lobby featured a stuffed head of a deer, many copper items, an American flag and a DJ. “Use your key card and start going places” was written above the key card slot in the elevator. My room is wallpapered with the sheet music of the opera Patience. Not some random sheet music, but an opera from the late 18th century that and as a satire also did things different. A perfect fit! The hotel guide is called “The Ace Survival Guide – a manual for food, drinks and other ephemera. Then my eye falls on a set of cards held together by a thick band. I push the belt aside and read ‘Here are some art cards by artist Miho Hatori. We love them. We hope you will, too. Because they’re yours now. – Ace ‘. Smoke outside. Meet a stranger. Under the “no smoking” symbol in the room is written “Smoke outside. Meet a Stranger “and then in small text” Smoke inside, pay a stranger $ 250″. It can be that simple. In the elevator I meet another guest who is so enthusiastic that he tells me he had a real DJ set and a guitar in his room. Where do guests talk in the elevator about their room? Neat! 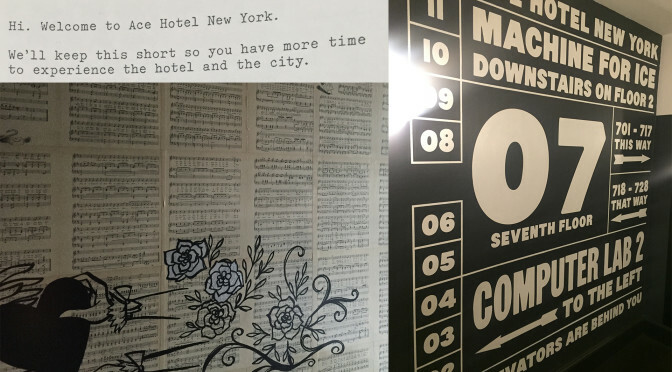 The Ace Hotel is in my opinion THE example of a brand-worthy hotel. It is a hotel that continues to be Ace by being different and consistently executes that to the smallest detail with employees who have the brand in their DNA. 100% Ace! Doing so creates fans. And fans come more often, spend more and tell your story. This article shows exactly that! The findings are in line with Facebook’s own findings. CFO David Ebersam reported during the presentation of the third quarter results of 2013 “We did see a decrease in daily users partly among younger teens … This is of questionable significance.” Wow. What is happening here? Facebook is the current leader of the entire social networking category. “Facebook is a social network that brings friends, colleagues, classmates and acquaintances together”. And that is a long-term problem. If you are everything to everybody, you will eventually become nothing to nobody. It is logical that new social networks that focus on smaller segments or new categories will divide the big Facebook pie. A good example is Pinterest, the social networking site that acts as a bulletin board and has a tremendous growth. These focused sites attract new users who are not using any social network, but more often users of Facebook. This leads to a smaller group of Facebook users, resulting in content of inferior quality, making the brand less interesting for existing users and more difficult for advertisers to targeted audiences. 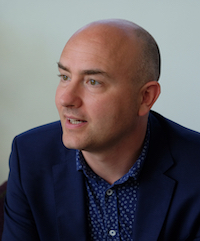 In the long run the market will simply demand a focused approach because the perception of a focused brand is always better than the perception of a comprehensive one. Which brand do you think is better in high end watches, the one only making high end watches or the one making high end watches, jewelry and clothes? Which restaurant brand makes better Thai food? The one preparing Chinese, Japanese and Thai or the one just preparing Thai food? Would you rather have a TV+Bluray+Digibox combo or have it separate? Do you trust the all-around surgeon for an operation or would you rather go with a specialist? And finally, which bakery brand bakes better French bread? The bakery called Rezé “Boulangerie Traditionnelle Francaise” or a bakery baking all kinds of breads, including French? If you are an entrepreneur make sure you are focused enough and associate yourself with one category, not many. If you are an established business and want to have relevant brands in the future, it is time to make choices about the category in which you are active. Don’t follow Facebook. Coca-Cola Company feels pressure as the overall soda drink category is in decline. At the moment Americans drink about 167 liter of soda per year. This is a drop from about 201 liter in 1998. Water has again become America’s favorite drink, with an increase of 38% from 1998 to about 211 liter per person per year in 2013. At the same time there is a growing pressure to fight obesity. Even so that New York City tried to put a size limit on sugar soda drinks served in the city. It seems though, that it is not just the sugar soda category that is in decline, it is the diet soda category as well. To turn the wheel Coca-Cola Company started running an advertisement to defend the use of artificial sweeteners. The advertisement has the following headline “Quality products you can always feel good about” and then goes on saying “Our use of high-quality, low- and no-calorie sweeteners, including aspartame, allows us to give people great-tasting options they can feel good about”. Why would Coca-Cola Company defend the use of artificial sweeteners while there is clearly a trend towards natural? In the US the growth of organic food and beverages has grown from $1 billion in 1990 to $26.7 billion in 2010. The global alternative medicine sector is expected to reach close to $115 billion by 2015. This is all fuelled by a trend towards herbal and nature-based products. Coca-Cola Company should see this trend as an opportunity and not fight it. After all, when consumers see an advertisement defending ingredients in products it can be interpreted as coming from somebody trying to ‘prove them wrong’. Especially since the perceived honesty and ethics standards of advertising practitioners are very low. In the US they are just above the bottom two: members of congress and car salespeople. Instead, Coca-Cola Company should ride the trend and grasp the opportunities now before somebody else will. First, Coca-Cola Company can position Coca-Cola as the number one brand in All Natural Cola: a Cola truly made of 100% natural ingredients, no chemicals, nothing, just natural. Second, Coca-Cola Company should consider introducing the natural Stevia sweetener in Cola products. It recently started doing that in some countries with Sprite. The tough question to answer is: will it keep using sugar in its normal Coca-Cola and use Stevia only in the diet/light variants or will it go the full way and kill the diet/light products all together? Either way, the soda business is up for a change, a change towards becoming more natural. We all know Instagram, the app to take photos with your mobile, apply beautiful filters and share them. Instagram makes pretty much any photo look good! Recently Instagram added the possibility to create videos, add beautiful filters and share them. The question is: does it really matter? Will Instagram users care, follow and start sharing videos enhanced with filters en masse? The answer depends very much on how Instagram is positioned in the minds of users. When users think “apply filters” but say “just Instagram it” then yes, users could make the leap. But I have some doubts. First, Instagram is simply the #1 photo sharing site for photos with filters. The core of Instagram is photos + filters, it is not the other way around. This is very hard to change. Secondly, in the photo and video online business it is not about convergence, it is all about divergence. Flickr has done videos since 2008, but videos are really hard to find on the site. In fact, there is not a single mentioning of “video” on the flickr.com home page. The same goes with professional photo editing tools. Adobe Lightroom and Apple Aperture both provide possibilities to edit videos, but no mentioning of this feature on their main product pages. While the adoption rate for Instagram with video will be huge and we will see plenty of users trying it out, I do believe that the better route for Instagram in the long run would have been to keep focus and continue to bring only the best possible photos + filters experience under the Instagram brand. At the same time Instagram could have expanded the business to video by either acquiring an existing company or by starting a new brand with a dedicated focus on video + filters. This would allow the company to innovate in both categories without dependencies. More importantly, in the long run, it might bring in users who are not using Instagram for photos or don’t want to use it. Good examples are Twitter and Vine (which is owned by Twitter). Both are about snippets of information, Twitter in text, Vine in a 6 second looping video. Both are managed under a separate brand. A case could have probably been made for Vine to be called Twitter Videos, but luckily it got to remain as an own brand and look what happened! Context: In Finland is a burger fast food duopoly between McDonalds (American) and Hesburger (Finnish). In May Burger King announced it would re-enter the market (their first attempt years ago failed) through a local chain called Restel. Big news when Restel announced to bring Burger King back to the Finnish fast food market! Of course, McDonald’s quickly pointed out that the fast-food market in Finland is tight. Indeed, after Hesburger bought Carrols in 2012 the common believe might have been that the Finnish market is to small to go beyond a duopoly. Nothing could be further from the truth: with the arrival of Burger King the burger brand battle is about to start! For the current players in the market, McDonalds and Hesburger I can only see trouble at the horizon. In general brands are strongest when they mean one thing and one thing only, like Heinz = Ketchup. This is the power of focus. Both Hesburger and McDonalds are currently not very focussed brands. Let me ask you, how would you describe McDonalds or Hesburger to your friends in a couple of words without using any marketing talk? It is quite difficult, isn’t ? I have heard some: McDonalds is the original or American, Hesburger is Finnish, there is a difference in mayonnaise etc. These are all right, but they do not help McDonalds or Hesburger to position itself clearly in the market. Burger King on the other hand can capitalise on a very strong position: Burger King = Fire-grilled beef. So, if you want a fire-grilled beef burger you go to Burger King. When it comes to brand clarity Burger King is currently the winner! McDonalds could focus on being the really FAST, fast, food restaurant. After all, a fire-grilled beef burger does imply slowness to it. Another alternative is to (re)focus around family: McDonalds, the family fast food restaurant. What McDonalds should not do is to further increase the number of products. For example, the current MyBurger campaign does not help to increase clarity of what McDonalds is. It is merely a nice marketing activity but it is not helping to build the brand. Hesburger will be in an interesting position. Being a Finnish chain in the middle of the two American giants they should play the Finnish card. This could be done through ensuring everything they sell is produced in Finland. If this means reducing items on the menu, then go for it! For example, a Fish burger made of fish from Finland. Of course, on the box you can read which Finnish fish is used in the burger. Another alternative is to play on the Finnish taste buts. Hesburger will be perceived to know the Finns best! Now, is the Finnish burger market really so tight that there is only space for three chains? I don’t think so! Could you imagine a chain that only and only focuses on organic burgers? I can! Or what about a chain like the In-n-Out burger in the USA that has only three top notch quality burgers on the menu? Could that work? Of course it can! I claim that in Finland there is space for at least five burger chains… let the burger brand battle begin! 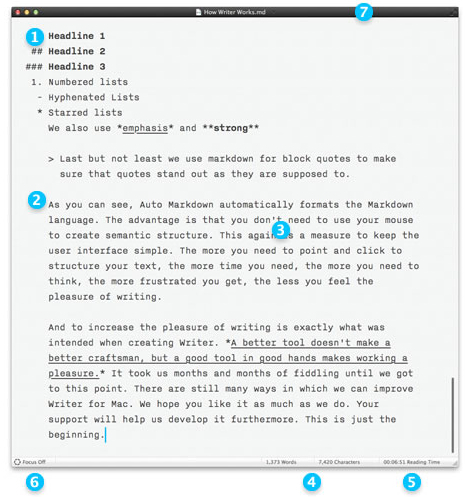 Something amazing happened last May when a company called Information Architects released the Mac version of iA Writer, “a digital writing tool that makes sure that all your thoughts go into the text instead of the program.”. Why is this is amazing? Well, iA Writer just entered the word processor category traditionally dominated by Microsoft Word and Apple Pages. 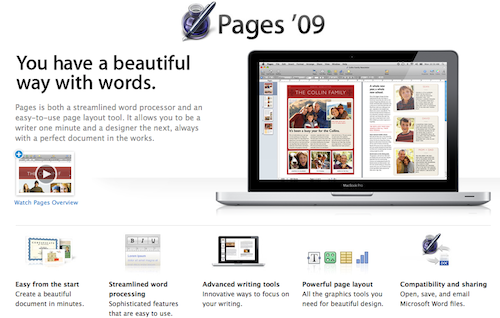 Both Word and Pages are of course expected to do… well… lot’s of word processing…! A closer look at the propositions of Microsoft Word and Apple Pages reveals that while these products in a distant past might have been about word processing today they are clearly about something else. 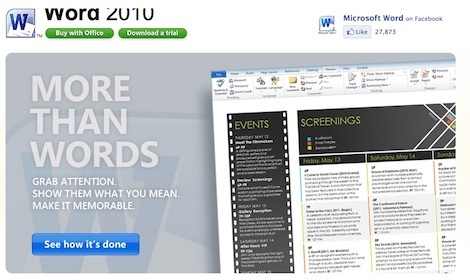 When looking at the Microsoft Word website the browser bar still says “Word 2010 – Document and Word Processing Software – Office.com” but in reality the focus of Word today is more on desktop publishing, as Microsoft says Word is “More than words”. 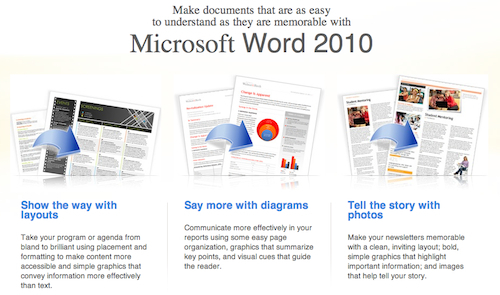 There you have it… Word 2010… bye bye word processing, hello to desktop publishing! There is a bit more word processing going on here but the end conclusion is the same: bye bye word processing, hello to desktop publishing! While Microsoft Word and Apple Pages have left the word processor category and are moving into the desktop publishing category the move made room for new entrants: hello iA Writer! It is a true word processor, the only thing it does is … word processing and everything is optimized for that. 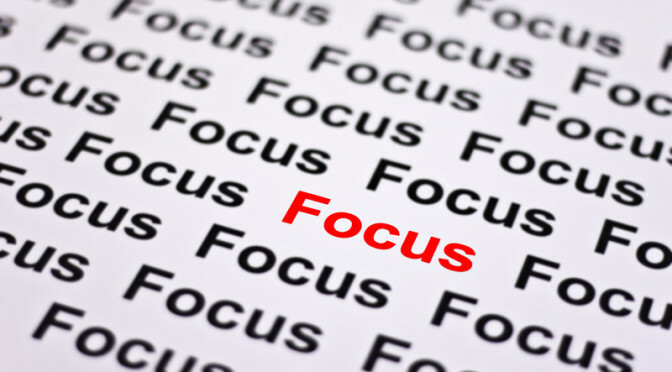 Focus mode: this is the real differentiator: in Focus mode all the text fades out except for the sentence you are working on so you can, well… focus. The result of delivering a focused product is pretty stunning: iA Writer is a top 10 app in the productivity category on the Apple App Store. Even more stunning since in this category the top 4 apps are Apple products, including Pages ranked 2. Furthermore the consumer ratings are high: 4.5 stars with lots of raving reviews with titles like “an app I didn’t know I wanted”, “Professional Writers, Rejoice” and “Insanely gorgeous”. So here you have it: when companies or products leave the category in which they originally entered it leaves space for new entrants, even in the word processor category that I never thought would be such an exciting category! How wrong I was! iA Writer shows us that when you focus your product in a category occupied by “do it all” products you do get noticed and can reintroduce the category to consumers. Well done iA Writer! The other day when visiting Amazon.com I got a surprise: a new home page! I guess Amazon is testing and therefore spreading the new home page in the wild with some customers. 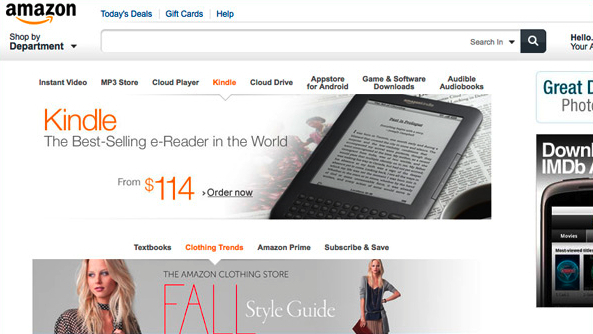 The new home page shows the new direction of Amazon. In fact it is a long departure from the Amazon that we all know so well. You know, the company that sells physical goods, “Earth’s Biggest Retailer“ and has a well earned number one position. Not so any more. Today Amazon reinvents themselves as a digital retailer. What a really bad idea. I wrote earlier about Amazon and their line extension move to digital. There were clear signs that Amazon might fall for the line extension trap. Clearly, in the “new” Amazon these are not as important anymore. It is now all about digital. Some of Amazon product categories are challenged by more focussed brands like Diapers.com, Drugstore.com, Bookrepository.com and many more, but Amazon has still competitive advantage over many of the challengers by offering Amazon Prime (‘free’ shipping for 79USD per year) across all the product ranges. The big question for me is: what are the guys at Amazon HQ’s thinking? Why dilute the meaning of the Amazon brand by entering in the digital space? You did it right with Kindle (you did not call it the Amazon reader) and MyHabit (you did not call it Amazon Fashion Goldbox) and you should have done exactly the same with digital. Keep your brand where it is established, especially when it is number one in a category and create a new brand for digital, that is what Amazon should have done. Amazon.com: what happened to the promise of Earth’s Biggest? 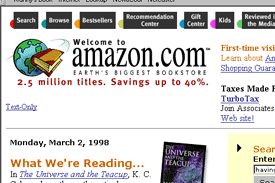 Back in the days the promise of Amazon was “Earth’s biggest bookstore”. How easy to believe! Millions of books at a good price with a brand named after another earth’s biggest. Then Amazon moved on from just books to CDs/DVDs/Games. In my view all still very logic and Amazon executed the right strategy to stay “Earth’s Biggest” in these categories. How? By being The Biggest. It did not stop there, Amazon expanded further, according to their website “today, Amazon offers everything from books and electronics to tennis rackets and diamond jewelry.” Still, this enormous expansion works. When living in New York City we “amazoned” pretty much everything. Amazon became “Earth’s Biggest Retailer“. This positioning was supported with help of “Amazon Prime”: free 2 day shipping for a yearly fixed fee that tremendously helped taking away the two headaches of internet shopping: delivery fees and delivery time. At the moment Amazon has expanded even further. This time however the expansion goes beyond the Retail category. This expansion is where future problems for Amazon will come in. The Amazon.com shopping experience is now split in “Digital” and “Physical”. In other words: the line extension split is made very explicit to consumers. Why will this not work in the long run? Firstly, Amazon has expanded the brand from retail to digital media consumption. As we know expanding brands in new categories include a risk: consumers can get confused with your current position. Why risk it? Fast forward a couple of years and think about what consumers would answer to the question “What is Amazon in one word?”: is it web shopping, cloud storage, a sort of Netflix or still the best place to buy products online? Secondly, this move endangers Amazons current positioning of Earths Biggest in physical goods, a position they should simply not give up! There is plenty of competition that has a very reduced scope and focus, such as The Book Depository. Book Depository sells well… books (and only books) but differentiates with free worldwide shipping. Since we live in Finland it has become my number one go to book site. So Amazon will need to improve in all the sub categories of the products they are selling to stay Earths Biggest. Thirdly, in “Digital” goods Amazon is far from being Earths Biggest, and even if Amazon would be in terms of numbers they are not in consumer’s mind. In this space there is lots of existing and established competition. The option I would have recommended to Amazon is to strongly consider launching a new brand, let’s say Everest. Amazon did it right with Kindle. Calling the current Kindle product the “Amazon reader” would have been a disaster. Think about it… would a consumer go to a shop to buy an Amazon? No, they wouldn’t, but they do go to the shop for a Kindle. And it pretty successful: Kindle is now synonymous with e-books/ digital reading. Everest would on one hand be an part of Amazon, just like how Kindle and the Kindle Store are today. On the other hand on Everest.com would attract new customers who not necessarily would go to Amazon.com for digital media consumption. The “only” thing Amazon would need to make sure is that Everest.com would create a consumer need based on something new, not serving consumers the same or very similar stuff they can get with the established players. So what is a Volkswagen? Frankly I have no idea what it wants to be anymore, but to me it has always been the Beetle and the Golf. Check out the Volkswagen Classic website with all models between 1949-1999. I am curious to hear which models strike you as being a real Volkswagen. There is a problem at the Volkswagen Group. With four main brands in the <100K EUR segment (Volkswagen, Audi, Seat, Skoda) and each with an enormous amount of model brands there is overlap for sure. I wrote about VW versus Audi in the USA earlier. There has to be a way to optimize, reduce the overlaps and create clear(er) identities. This will prevent in the long run each of the brands at the Volkswagen Group to lose meaning and long term profitability. Volvo: keep your brand focus on safety or be toast! In every brand book or brand program there is usually the example of Volvo, the brand that has positioned itself in the car category synonymously with the word “safety”. Unfortunately, unless Volvo changes its current course this good example will turn in an example how to destroy a unique brand position. About two years ago everything was still very much on brand positioning. 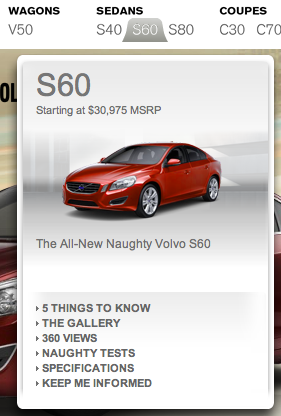 Take a look at the screenshot below taken from volvocars.com/us. 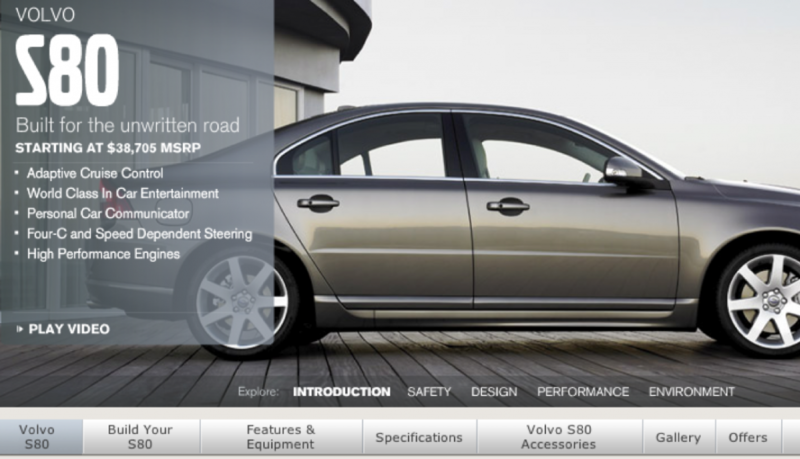 It shows the Volvo S80 page with the key sections: Safety, Design, Performance, Environment. Yes! Safety FIRST, of course and exactly what everybody expects from Volvo! Design is obviously second. A car designed in Sweden does bring magic! Both safety and designed in Sweden are great differentiators! Performance third, it simply cannot be first because nothing can jeopardize safety. Finally the environment: Volvo is a good citizen. Everything simply makes sense! 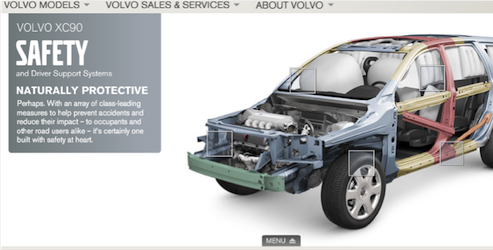 When clicking on the Safety section it will give you all the details you need to know in order to believe that Volvo is the safest car on the planet! The above navigation structure was very consistent implemented with all Volvo models, below an example of the XC90 Safety section. 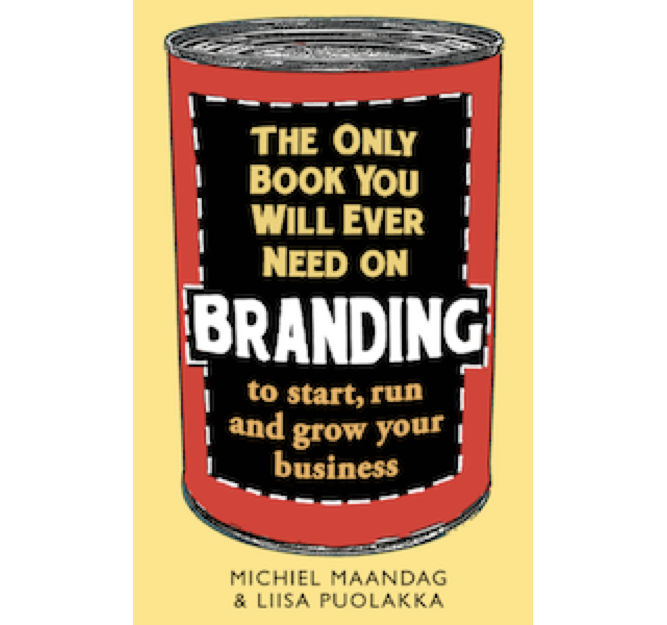 Now fast forward to 2011… and a lot of brand building has been destroyed. That’s right! Safety has now moved to the 4th place of the “5 things to know” about the S80. Also note that it is not anymore just “Safety” but “Safety innovations”. Why is that? Would I not expect the safest car brand to innovate by default? Why would Volvo want to stop owning that one word “safety” and make it “safety innovations”? If this was not enough Volvo is happily positioning itself away even further from Safety by introducing the concept of Naughty cars. Just check the Volvo S60 pages and you will find out that the Volvo S60 is everywhere named as the “All-New Naughty Volvo S60”. Wow! What happened at Volvo headquarters? Naughty Volvo? What is that all about? It obviously should look like this! Volvo = safety! Volvo this is really bad… you really had the best position in the car category, who after all does not want a safe car? Now you give your positioning away by trying to be Audi. Your consumers will not understand because to them you always will be the brand that is about safety. That is, till you proof them wrong a little too long trying to be somebody you are not. Please change or you will be toast. Continue reading part II, written three years later.